Volume 10, Issue 3; January 20, 2010: What Do You Need? 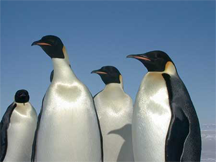 A group of Emperor Penguins. The Emperors are famous for what seems to us to be a tortuous and inconvenient way to incubate their eggs. Males spend much of the winter huddled together in large flocks to conserve body heat, each male shielding a precious egg from the cold in a brood pouch over his feet. The males fast for two months during incubation, while the females go off to feed. This seems a rather extreme approach to child rearing until you consider that this method does provide the Emperors what they need. What they need is time. The Antarctic summer is too short for chicks to incubate and mature enough to survive a winter. By incubating during winter, Emperors give their chicks an extra two months to prepare for the next winter. And when the chicks emerge from their eggs, the food they need is most abundant — perfectly timed. Read more about the Emperor life cycle. Photo by Josh Landis courtesy Wikimedia. Sometimes you're asked by another, "What do you need?" or "What do you need to make this work?" Recognize these questions as great gifts — most often, the asker is sincerely trying to help. Sadly, and too often, the answers we supply are self-defeating. They do lead the asker to supply what we ask for, but we ask for things that don't really help, and we fail to ask for things that would really help. How does this happen and what can we do about it? I've seen several different ways to supply self-defeating responses to this great gift of a question. Rather than offer a catalog, here are some guidelines for providing helpful responses. Know the difference between "wants" and "needs"
Confusing what we'd like with what we actually must have can be disastrous. We can find ourselves spending goodwill and political capital reaching for non-essentials. A simple test to distinguish wants and needs begins with asking yourself, "If I don't get this, is the goal achievable?" If the answer is no, it's a need. If the answer is yes, then ask, "At what additional cost is the goal achievable?" The answer to that then becomes a new need. Once we know our needs, we usually find that some are a bit mushy. For example, we might not know how long something will take or how much it will cost, or how much mastery a candidate team member truly possesses. Even when needs are mushy, you probably can determine your minimum requirements — your redlines. Know your redlines and be prepared to communicate them clearly. Resisting the temptation to take on the problems of others is difficult. (See "Stay in Your Own Hula Hoop," Point Lookout for June 27, 2001) When answering the what-do-you-need question, we sometimes include the needs of others on whom we depend for our needs. Instead of listing others' needs, enumerate your own. Include the items you need from those others. What your suppliers need is not one of your needs. It's one of theirs. have can be disastrousis another difficult-to-resist temptation. We tend to offer what we think will be the ingredients of solutions rather than the outcomes we actually need. Instead, focus your answers on what you need. You can suggest ways of achieving it, and those suggestions might lead to joint problem solving — a most desirable result. But be clear about the distinction between what you need and how to get there. Would you like to see your comments posted here? rbrenoZoeFOybjXFlucmjner@ChachfilIejdeFtkdWDqoCanyon.comSend me your comments by email, or by Web form. I offer email and telephone coaching at both corporate and individual rates. Contact Rick for details at rbrennwSnrYVKehLEgXNpner@ChacEWgKIsqWhvSVukLAoCanyon.com or (650) 787-6475, or toll-free in the continental US at (866) 378-5470.